King Willem-Alexander and Queen Maxima of the Netherlands began a two-day visit to Bavaria on Wednesday, and Maxima wore vibrant pink for the occasion. 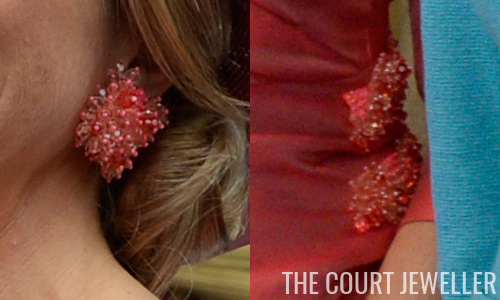 The pink beaded earrings are made to match the dress; see the beaded dress detail above. 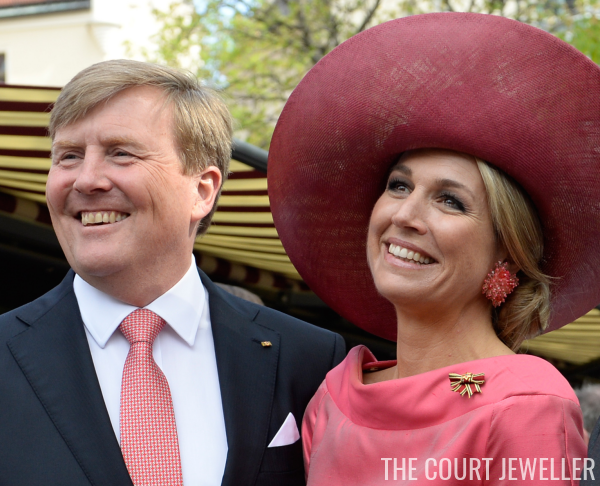 The small bow pinned to Maxima's dress is the ribbon of the Order of Merit of the Federal Republic of Germany. Maxima also wore a set of bracelets set with rubies, sapphires, and emeralds, plus the ruby and diamond ring she received from her husband after the birth of their eldest daughter, Princess Amalia.